In Ep. 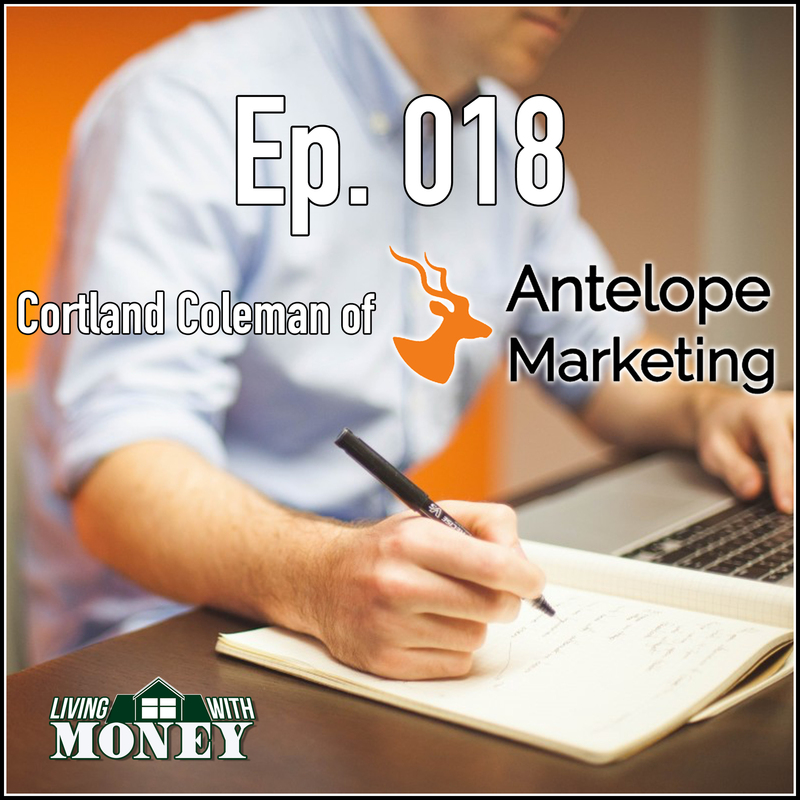 018, Tim talks with Cortland Coleman from Antelope Marketing. They discuss how Antelope Marketing helps small businesses with their marketing strategies by creating targeted, emotionally connective content on all platforms. Cortland talks about the importance of story-telling in marketing, and outlines the four crucial steps to good story-telling. Enjoy! Tim: Welcome back to Living With Money. This is Tim Mullooly. On today’s episode I have Cortland Coleman from Antelope Marketing here with me. Cortland, thanks for coming on the podcast. Cortland: Thanks for having me Tim. It’s a pleasure. Tim: For our listeners out there can you provide a little bit of background on yourself and what you did in life up until getting started with Antelope Marketing. Cortland: Well I’m a Jersey Shore boy born and bred. I was raised in Point Pleasant. Eventually made it out to Arizona where I went to college at Arizona State University, just outside of Phoenix. After graduating from Arizona State University with a degree in Political Science I spent some time in politics. I actually ended up working for both political parties while I was in Arizona and then went to work for the governor of Arizona around 2002, 2003. During that time when I was working for the governor of Arizona my wife and I were blessed by a child and it was a few years later we realized that we wanted to raise our newborn son at the time around his aunts and uncles and grandparents and everybody that was back east. And so in 2007 we decided to pull up our roots in Arizona of which we were both out there for 13 years so there were significant roots, bring it all back east, so we moved back to New Jersey. And I spent a little bit of time in Trenton at the State Department of Environmental Protection before jumping to a lobbying firm for about a year and then before in 2009 setting out on my own once again to start Antelope Marketing and start working with small business clients. Tim: Did you take some things that you, on the political side, that transitioned sort of into the marketing business? Is there a little bit of overflow from one job to the other? Cortland: There’s a lot of overflow. Absolutely. It’s all messaging, communication and persuasion. Whether it’s politics, business or figuring out where you’re going out to eat with your family. There’s a certain amount of messaging and communication and persuasion involved in everything we do. And so I really saw a lot of that transfer directly over to marketing and the great thing about working with a lot of small business owners they are really really results oriented and they’re not afraid of innovative ideas. Sometimes politicians like to play it safe. I don’t know if you can imagine that or not but business owners are really interested in interesting innovative ideas that move the needle for their results. Working with them has been a lot of fun and there’s been a ton of overlap between politics and what I did there and what I do now. Tim: In politics you’re essentially marketing your candidate towards the people you know to try and get them reelected or into a position or to get some sort of legislation passed. So it is marketing in a different sense. Cortland: It definitely is. And even after you win the election which is what happened in Arizona, we actually won a historic election. Then it was time to govern and then you had to communicate policy and communicate what you were doing to benefit not just the people of your party but the people of the entire state. So it really honed some of my skills when it came to messaging and communication in a way that I’ve definitely benefited from I feel like. Tim: Coming from politics to like you said small business owners are more interested in innovative tactics. It’s probably more interesting as a marketer to work with those clients as opposed to the politicians right? Cortland: It really is. One of the reasons for that I think is because each business owner has their own unique experience and history and story that brought them to where they are. As much as I enjoyed working for politicians and again I worked for both parties, this is a bipartisan thing. There’s a certain path that you take in politics and there’s a lot of similar paths and similar stories with the idea of just attaining a higher office. But working with business owners they come from such varied backgrounds, they have such unique interests and there’s such colorful characters. If you’ve started a business on your own and you’ve tried to build it into something that’s leaving a legacy for your family there’s a certain amount of determination and ego and personality involved in that and working with those colorful personalities has been a lot of fun and really keeps us on our toes. Tim: You work with a lot of small businesses in the area, is that mainly the type of clients that you’re looking for your firm? Cortland: Primarily, yes. We specialize in working with small business owners who are local and geographically set. They serve the Jersey Shore area or the tri state area and they’re independent, usually not part of a franchise or a larger corporate entity. And typically they don’t have their own internal marketing department, there’s not a marketing person down the hall. And so that allows us to come in and offer a set of ideas and services over time to fill in that role for them and to serve as kind of their defacto in-house marketing person even though we’re out of the office. Tim: What kind of services do you provide your clients? Cortland: A lot of our services these days revolve around online marketing and communications. Web site, social media, e-mail newsletters, online advertising. But my roots and background and a lot of the things we still do for our clients involve offline marketing. You can do all the social media posts and all the online digital marketing you want to, at some point ninety nine percent of businesses have to take the relationship or the discussion offline and translate that into a visit into the office or somebody stopping into their store or buying something at their bar or whatever the case may be. There’s a lot of power in online and it’s really kind of democratized a lot of the marketing out there but there’s still a need to take the relationships offline into the real world and that’s what I like to think that we provide in a unique way. Tim: Yeah. You know with technology changing pretty much every single day there are new ways like you’re saying, social media and online to get your name out there, get your brand out there. What kind of balance and for different types of clients is there more of a heavy reliance on online marketing versus non online marketing or you know what kind of balance do you find with different types of clients and what kind of marketing works best for them? Cortland: Whenever we go into working with a business owner and their business the first thing we consider isn’t the tool set or whether this is online or offline, it’s who is your audience and where are they. Wherever they are hanging out, online, on social media or websites or forums or offline in towns or clubs or bars or boardwalks, that’s where we need to be. So some of our clients their audience is specifically online and on certain social media channels, those we’ll emphasize. But there are other clients, for instance a client we just did a print ad for a week or so ago who only wants to reach people in a very specific retirement community. So we’re doing a series of print ads in the community magazine. First thing to always consider, that we consider and that we would pass along to other business owners is where is your audience, that should determine the balance of online versus offline. Tim: You know you see people out there saying that certain types of marketing is not effective anymore, do you think that some of the quote unquote older types of marketing like direct mail and print ads are still as effective as they used to be? Cortland: Are they as effective as they used to be? Probably not because they used to be, a print ad was how you used to reach everybody. And it was this mass marketing. But now even the newspapers are niche with regard to the demographic and the geography and who’s reading it. Maybe they’re not as effective but they’re still part of the mix. They’re still an audience for print ads, there’s still an audience for direct mail. I got a piece of direct mail in my mailbox just yesterday that was targeted, that was tracked and that was very specific with a good offer. So these things are still in the mix. It’s my belief that someone that says oh that doesn’t work anymore, they’re simply not applying it properly or they haven’t done the legwork in really identifying their audience and determining where that audience is. Tim: So would you say that probably the most important thing for a business in marketing is not necessarily whether it’s new technology or old ways of doing things but just really honing in on where your audience is and making sure that it’s targeted correctly? Cortland: Absolutely. What if you as a business owner decided to go all in on social media or online marketing just to realize that you’re speaking to an audience that primarily is offline and makes their purchasing decisions and considerations through their community or through their civic organizations or they’re consumers of print media or broadcast media. So you really need to understand first and foremost where your audience is, who they are and where they are before you decide we think we should do Facebook or Snapchat or print ads or direct mail. The real question is who are we reaching, where are they, what are we saying. And then you deploy the tools to reach them. Tim: A lot of times marketing seems kind of hard to quantify the results. Unless someone comes in your office and says I saw your ad on TV or you know I got this letter in the mail or a Facebook ad or whatever it is. Sometimes it’s hard to quantify. How do you guys tend to quantify your results when working with clients? Cortland: The first thing we do out of the gate is determine the baseline, where are we. How are we doing without doing anything. And this is similar if you go to a new doctor. I think I heard in a previous podcast someone had tried a new doctor and they wanted to get a baseline of how that person’s health was. And that’s similar to what we do, we like to get a baseline of how’s your marketing and sales and advertising health in general. Being able to quantify marketing and advertising results is absolutely essential in the long term for these campaigns to be effective and to improve over time. So what we do is, campaigns that we work on with our clients we’ll specifically put some goals in place. That could be website traffic. It could be foot traffic in the store. It could be phone calls into the office or forms filled out on the website. But there has to be something you’re measuring so that you know if your efforts are moving the needle. And a very small example of this. We work with a client that does online pay per click ads through Google. When somebody searches for a certain thing on Google their ad comes up first and foremost, they invest about 500 to 600 or $650 a month in this advertising program. Out of every four or five leads that they get they’ll get a new client worth about fifteen to twenty thousand dollars. So for them it’s just an investment, if they go two or three months, invest 1500 to $1800 to get a $15,000, $20,000 client they’ll do that deal all year and they’ve been doing it for five years. Tim: It pays for itself. Cortland: It does pay for itself but it provides positive ROI, it’s an investment. When your marketing is an investment what we have found is business owners do a lot of it and do it aggressively. Tim: Right. I feel like some business owners hesitate to spend a lot of money on certain types of marketing because the dollar amount that they see going out the door is kind of eye popping. But do you try and you know change the mentality of your clients to like you’re saying think of it as an investment, you know get their ROI, their return back. Cortland: We are here at an asset management office. You’re not going to get any returns if you don’t make the investment, no matter if you’re returning 5 percent, 10 percent, 20 percent a year, it’s 5 or 10 or 20 percent of something, of the initial investment, of the principal. And so you have to have that initial investment with an eye to what is the ROI for marketing. Now marketing may be easier to gauge than the market or it may not be. But as marketers and as business owners that we work with it’s our responsibility and really the responsibility of a business owner to say if we invest $1500 over the course of 90 days what can we expect to get in return for that. And during the course of that 90 days, are we on track? Are we off track? Are we meeting our expectations? Are we falling short or are we exceeding them? That continual measurement and understanding of your key performance indicators and what’s moving the needle for your business is absolutely essential for business owners to really get a handle on so that they don’t see marketing investments as simply costs when it’s simply money going out the door so that you can do a Facebook ad for three days and you don’t understand maybe what you’re targeting or what you’re measuring or what you’re getting out of it then it’s not as much of an investment as we believe that it could and should be. Tim: Yeah you need to make sure that you’re spending the dollars the right way I guess is what you’re saying with the Facebook ads, you can run ads and spend money on it but if you’re not utilizing that tool correctly then it is less of an investment and kind of just a throwing something at the wall and seeing if it sticks. Cortland: It sure is easy to boost a post for a hundred bucks for a few days or for 25 bucks for a few days. But if you do that repeatedly with no sense of what are you aiming for or who are you reaching or what is your offer communicating or who is converting into a customer then you’re essentially just spending the money just to spend it and you’re not making an investment in your marketing and advertising. And we like to work with our clients on their long term investments in their marketing and advertising. It’s not just a quick hit for a holiday weekend. We develop programs and plans with them that carry out over the course of months and years so that they can understand, measure and realize that return on investment. Tim: Yeah that was another thing I was going to bring up. A lot of people in today’s society want instant gratification but that’s not, typically you know for a lot of marketing I feel like that’s not the way it works. It’s kind of like pushing a boulder, at first it takes a while to get going but you need to be consistent and keep momentum. Do you find difficulty or frustration with clients’ expectations or you know how do you try and manage their expectations and let them know that it’s most likely a long game? Cortland: Managing expectations is probably something that is underappreciated. Nobody has ever done anything great by only doing it once. Whether you’re investing, whether you’re practicing golf, whether you’re going fishing, whether you’re trying to get a date with the person you admire. You have to be consistent. You have to do it more than once, you have to have frequency because frequency gives birth to excellence and when you start doing it consistently or frequently you start to realize what you were doing wrong before. So you kind of shave out all those bad practices or shave out those bad practices and you’re left with an evolving picture of excellence. Look at any sports star and the practice and time and commitment they put in and look at the things we achieve in our own life. Look at our children. They don’t try just once to walk right. They get back up and they keep going back. Look at the guys who go down to the inlet at sunrise to catch fish. Ninety nine percent of them that’s not the first time they’re at sunrise. They’re there morning after morning after morning and whether it’s a simple example like that or these large companies that you see that everybody knows that still do marketing and advertising all the time, the Coca-Cola’s and Budweiser’s of the world, these large large brands. Frequency obviously breeds excellence and it breeds familiarity and it breeds confidence. If you’re always there the customer has a certain expectation of reliability that you’re able to meet. Consistency and frequency are absolutely essential to marketing. Instant gratification from our viewpoint doesn’t really exist in marketing and advertising unless you happen to get lucky with a viral video or a really interesting quirky offer. That is all the buzz and that’s what makes the news. But when it comes to day to day, dollar by dollar investing on marketing and advertising and sales you’re probably not going to get a video to go viral. You’re probably not going to get on Huffington Post or have this really unique, interesting buzz out of nowhere. You’re going to have to do it consistently and you’re going to have to do it creatively. You’ve got to go back to your audience over and over and over again and you’ve got to determine and develop ways of communicating your offers that hook them and turn them into customers and clients. Tim: And you know a phrase that I’ve read online about marketing tactics like what you’re saying like AB testing, being consistent allows you to do kind of AB test and always come up with better stuff. For listeners out there could you just explain the idea behind AB testing and why it’s such a good idea? Cortland: Sure and that’s something that we do. For example we talked earlier about a business that makes an investment in Google ads and that’s a really good example. If you’re investing in something like Google advertising you want to be first at the top of the results when someone searches for what it is you do or where you do it. The idea of AB testing is you start with an advertisement, let’s call it advertisement A. And let’s say that advertisement is shown 100 times and 20 people click on it and 2 people call. So you ended up with about a 2 percent conversion rate. What we’ll do then after 30 days or 45 days is then run advertisement B and see if we can tweak certain parts of the ad, not the whole thing, we don’t come up with something completely new. We tweak words, we tweak a phrase, we tweak part of the offer and we say okay now let’s show this 100 times and see if we can improve our 20 calls and 2 conversions to a client and if we can and if B proves to be a better ad than A in thirty or forty five days later we create ad C and we really just keep going so that you’re always hopefully improving your marketing and advertising and always trying new angles and new pitches. If you’re not AB testing or testing certain variables in your advertising and marketing you’re most likely leaving money on the table. And most local independent business owners can’t afford to do that. Tim: There’s always room for improvement. Cortland: And it brings in the science behind marketing. So it’s not just this kind of dark mysterious art. It’s quantifiable, it’s measured, it’s specific. There’s a method and when you have those things in place it makes the decision and investment a lot easier because it makes a lot more sense. Tim: So on the Antelope Marketing website, if you guys go there, we’ll link to it in the show notes, they have a blog up there with loads of great blog posts on different marketing topics and things to consider when marketing your business. One recently I came across a post about why and how to incorporate stories into your marketing. Can you tell the listeners a little bit about the benefits to storytelling in marketing? Cortland: That could be a whole podcast in itself. Cortland: I definitely will try and I’m going to try to summarize it. Storytelling is extremely extremely effective for a couple reasons. One is that we’ve been doing it as human beings for millennia. We used to sit in caves and around fires out in the wild and in forests and tell stories. It was how we defined who we were, it was how we passed on our culture and our tradition and our religion and our beliefs and our norms. So storytelling is inbred in who we are as people. It’s probably part of our DNA although I don’t know if they’ve discovered that yet or not but it is part of who we are and the other part that makes storytelling so powerful is when you start telling a story and you use the four essential ingredients of all good stories which we can get into if you want, is that the people who are listening instantly and automatically and without thinking place them self in the story. And they’re now experiencing the emotions of the story. They are understanding the character dynamics. They’re beginning the journey that the story goes on. And so they’re relating to it. And when you can get somebody emotionally involved and relating to what you’re doing or what you’re talking about or what you’re selling, you got them. There are studies that show people make purchasing decisions based on emotion. Yes they back it up with logic. Yes they like to think that they’re bringing reason to the table. But they are making at the outset initially an emotional decision based on a number of factors. Who was doing the selling, what their need is, so on and so forth. But for business owners that aren’t using emotion in their marketing advertising and sales they should do so and they will see a big difference right away. Tim: So you had mentioned the four secret ingredients to storytelling, do you want to touch on those briefly? Cortland: I’d be happy to and I think they’d be really helpful for the audience to understand and be able to use in their marketing. Basically every good story you’ve ever remembered, cared about, heard or told and told well has four essential ingredients and whether you know them or not or whether you can repeat them I bet that you will recognize them. Here they are. The first element and they all start with the letter C so they’re really really easy to remember. The first element, characters, you have to have characters if you have a story, you have to have somebody that the action happens to, you have to have a hero, you have to have a protagonist. Usually the character in most stories are some embodiment of good versus evil, right versus wrong. Some sort of hero on an epic struggle to overcome the challenges and that idea of characters, basic good and bad, is the first element in all good storytelling and it’s essential that business owners understand who the characters are in their business, whether it’s wealth management or whether it’s baking cookies characters are in play. And what happens to characters in a story? Well that’s the second element of great storytelling and that’s conflict. Something has to happen to the characters. There has to be some sort of interaction and typically the interaction is some sort of conflict because they have to be doing something, they have to be overcoming something. It could be conflict with themselves, it could be conflict with the outer world. But that’s the battle, you have the characters and just to hearken back whether it’s Shakespeare or Star Wars you see these repeatedly, you have the characters and you have conflict. Once the characters are developed the conflict usually starts right away. And again it’s some embodiment of good versus evil, right versus wrong. For small business owners it could be your product you know versus the competition or it could be whatever you provide versus the pain the customer is experiencing. So the first element, characters. Second element is conflict. The third element is climax. Tim: The exciting thing happens. Cortland: Exactly, the big exciting thing happens. For business owners this is when the prospect walks through the door and puts their money down and says I want to invest with you or I want to buy a dozen chocolate chip cookies or I want to buy a new pair of shoes or whatever. That’s the moment that you’ve taken a character through the conflict and now you’re about to experience the climax and that’s the transaction or back to our storytelling it’s the ultimate moment of action when our hero has overcome their struggles and they have that moment of yes I did it. And then what follows that is the fourth element and that is the conclusion. This is basically the we all lived happily ever after part. You came in and bought the dozen cookies and you just feel really good. And you shared them and it was a really nice time. Or you started investing and now you’re on path to be able to save for retirement and live the good life someday and do the traveling that you wanted to do. In Star Wars it’s the medal ceremony afterward, you know. It’s the talk that’s given at the end of the speech or the end of the play wrapping up all the loose ends. There’s the characters. There’s conflict. There’s climax and there’s conclusion and these elements are all embedded in all the great stories that we remember and that we share. And there is room for businesses to include these elements in their storytelling so that their messages have a bigger impact with their audience. They hit them, they hit the audience emotionally and hopefully most importantly move the audience to action. That’s the goal of so much of what we do and it’s the goal of good storytelling especially when it comes to business is moving people to take an action. And whether you’re a product, service, business to consumer, business to business, if you identify the characters in your story, you understand the conflict, you can help build to the climax and make sure that the people that you work with live happily ever after because they called upon you or hired you for the job. Tim: Right. That might have actually answered my next question but I was going to ask you know what’s the main thing that you would like people to know about Antelope Marketing? Cortland: Well I certainly want them to know at the top most level that we exist to serve small business clients around the Jersey Shore and around the Tri-State area. We work primarily with local independent business owners and help them craft more effective messaging so that they can have a bigger impact with their audience and ultimately increase their topline revenue. So what I want them to know and to remember is that for everybody we work with we take a very unique hands-On and collaborative approach. We work with them over time to produce specific measurable results. Tim: So we’re going to transition to a couple of last questions that we like to ask all the guests that come on here. How would you define being wealthy? Cortland: So you sent over a few of the questions in advance which I appreciate. This is the one I struggled with most, whether it’s thinking about my own eventual retirement and my family and all of that or how I deal with money day to day I don’t know that I’ve ever really defined wealthy in my own mind. So as I was preparing for a recording of this podcast I had to spend some time and think about how do I define wealthy and it was a little bit tricky but I think ultimately what I came to was a point where if you’re wealthy price is not an impediment for what you want and I guess I see that through a couple people in my life, a couple of close friends who I would consider as wealthy, they have abundant resources. The things that they want in life they just go and get. Yes there’s a price tag but the price tag really doesn’t matter at the end of the day. They see something, they want it, the next day it’s there. I’ll spend, example from last weekend, 20 minutes at Home Depot trying to analyze which is the better fertilizer for my yard you know so I can get the best deal. You know what is it going to be, $25 or $35. It’s kind of almost silly in a way when I say it now. I think being able to make purchasing decisions whether it’s fertilizers or Ferrari’s without price being an impediment or major consideration then you’re wealthy. Tim: You know we always like to send these questions ahead of time and a couple of people have said what you said. I hadn’t really thought about that until you know I looked at that question and I feel like it’s a good thing for people to think about. You got to know what wealth means to you because then you know if you’re there or not. Cortland: It’s essential. I didn’t realize how much I hadn’t thought about that even though I think we all think about our retirement and savings especially as we get older in life. But how are we really defining wealth? How are we going to define the good life? Because if we don’t define it we may or may not be living it and we may or may not even know. And I really appreciated that question and it really sparked a lot of thinking in my own mind and I’m glad to hear that other guests have felt similar. Tim: So next question. For someone just entering the marketing industry today, we talked about earlier how technology and the world is constantly changing. What would you say is the most important thing that you would tell someone entering the marketing field today? Cortland: Two of the most important things for them is not to take a cookie cutter approach and realize that each client is unique. Consider what the clients goals are, who they are trying to reach. And don’t be so obsessed with the tools that are in the tool box but be obsessed with getting the results and making an impact. And then second and this is for anybody entering the marketing industry or the financial professional industry or whatever industry they’re in, if they’re going into business for themselves or even starting out in their career they have to learn how to sell. In this world if you don’t know how to sell yourself, your ideas, your cause, your product or service, you’re toast. I was meeting with someone recently and they went into career day at their kid’s school and they asked the kids to put up their hands, who wants to be a salesperson when they get older? Not one kid raised their hand. Then they said well who wants to be rich and have an oceanfront home and have a Lamborghini and every single kid raised their hand. And no matter what business we’re in ultimately the bridge that’s going to take us to where we want to be is sales and business development. So we have to be better at sales and we have to be better at understanding business development cycles for each of our products and services. And so I know that’s not really a marketing answer per se but I think it’s an essential answer. Tim: It definitely applies and that’s something that I was told when I first started working as well is yes I’m going to become an investment advisor but you’re also in sales, you know even though we don’t necessarily sell like a product here, you’re selling yourself and you’re selling service and trust and building relationships with people. So regardless of industry you know you’re something and a salesman. Cortland: Unless you’re going to be in a 9 to 5 job and get paid a specific wage to do something very very exact, move a widget from point A to Point B, you need to understand the basics of sales and persuasion in this world because it will take your career and your finances further but ultimately it will lead to a better quality of life. If you’re able to corral people to your ideas, to your way of thinking, you are going to have a bigger impact and get better results. Tim: So we talked a lot about work and marketing here. Other than then work and Antelope Marketing, what’s one thing in life that you’re extremely passionate about? Cortland: There is life beyond work, huh? Cortland: I’ll have to find some time for that in the coming weeks and months. Obviously my family is number one and just being a good parent to my son. I grew up in a divorced mom so dad wasn’t always around so being that dad who is around is really important to me but I also love fishing and playing drums and smoking cigars and the Yankees and summer times on the Jersey Shore too. I mean I just love life on the water and boating and fishing. Tim: I’d have to agree with that. Not so much on the Yankees. I’m a Mets guy but I also play the drums so you know we’ve got a couple things in common here. Cortland: That’s right we do. Tim: So maybe we’ll talk drums after recording but that’s going to wrap up this episode. Cortland thanks for coming on. I really appreciate you taking the time to answer some questions today. Cortland: I really appreciate you having me. It was lot of fun. Tim: If you’re listening to this on iTunes please subscribe to the podcast to get new episodes every week and feel free to leave us a review or comment because it would really mean a lot to us. Be sure to follow us on Twitter and Instagram at LWM_podcast for more news and updates about the show. Anyone out there you know, like I said before we’re going to link to Antelope Marketing in the show notes, be sure to check out their website and you know they have a lot of great blog posts and good information on their site so be sure to check that out. Thanks for listening to this episode of Living With Money and see you on the next one.